12 Days of Christmas…Teacher’s Edition! 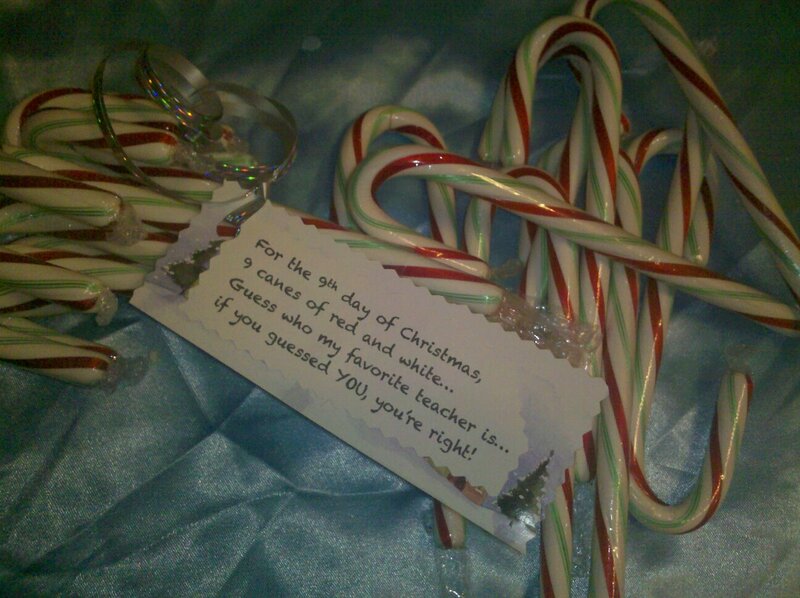 As my son and I were coming up with ideas for his pre-k teachers Christmas gift, I thought what is better than 1 gift? How about 12 gifts, and celebrate Christmas and the magic that comes with giving someone something special. I’ve always heard that teaching is somewhat of a thankless job, so I decided to make a point to show the teachers who spend their days forming my child’s mind. So here goes what we did for our 12 days of Christmas. I am a thrifty person at heart, so I started shopping for these items when he started Pre-k back in August. Clearance section at Target was the best place to find items at .25 cents a piece. Day 1: Clip Boards. 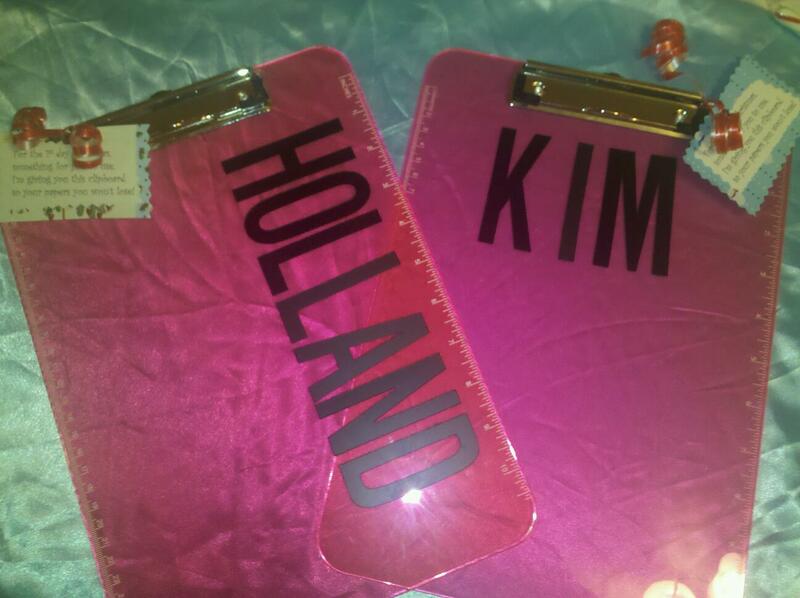 I had some vinyl letters cut out to put on them that spelled out the teacher’s first names. Day 2: Two stampers. These came in a pack of 5 from Target and were in the dollar section; I paid maybe .50 cents for all 5. Day 3: 3 binder clips, these were from the dollar store, 1.00 for a pack of 10. 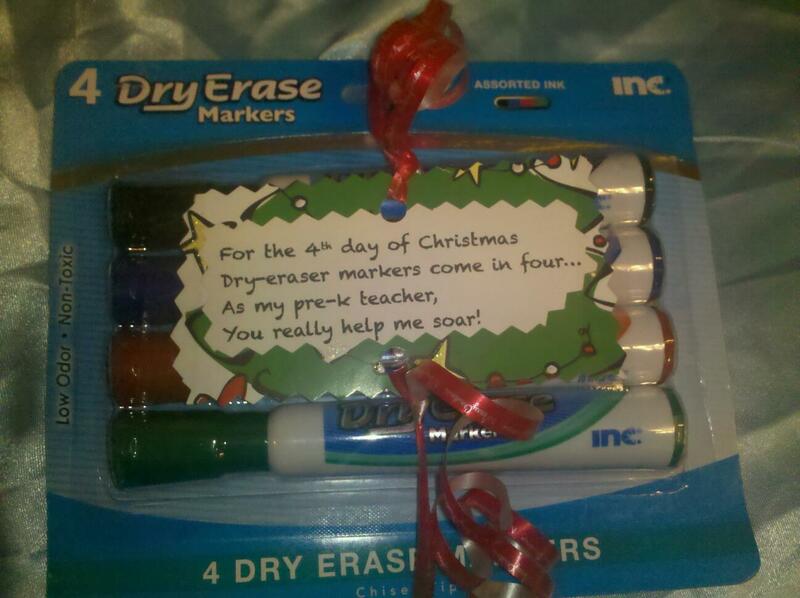 Day 4: 4 dry erase markers, again dollar store 1.00 for a pack of markers! 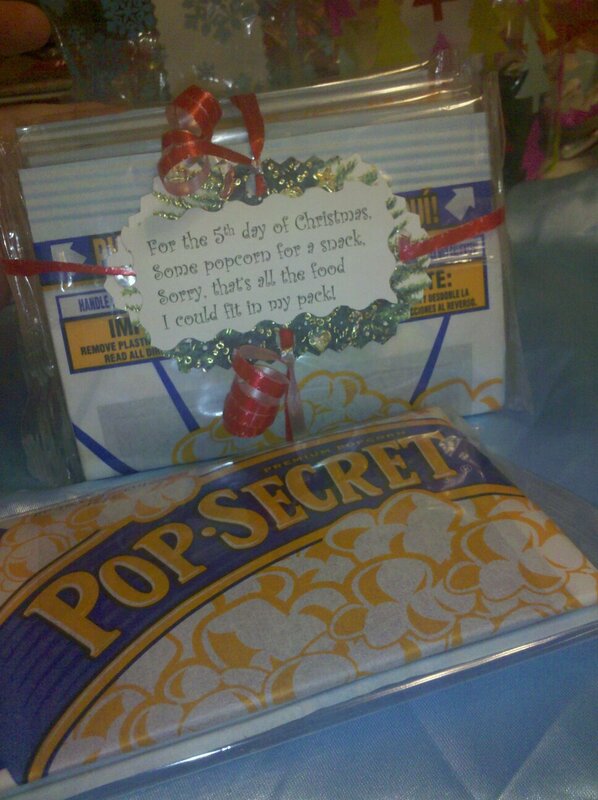 5th day, 5 pop corn bags, bought two boxes from Publix grocery store, they were on sale BOGO and I had a coupon so they were less than 1.00 a piece. 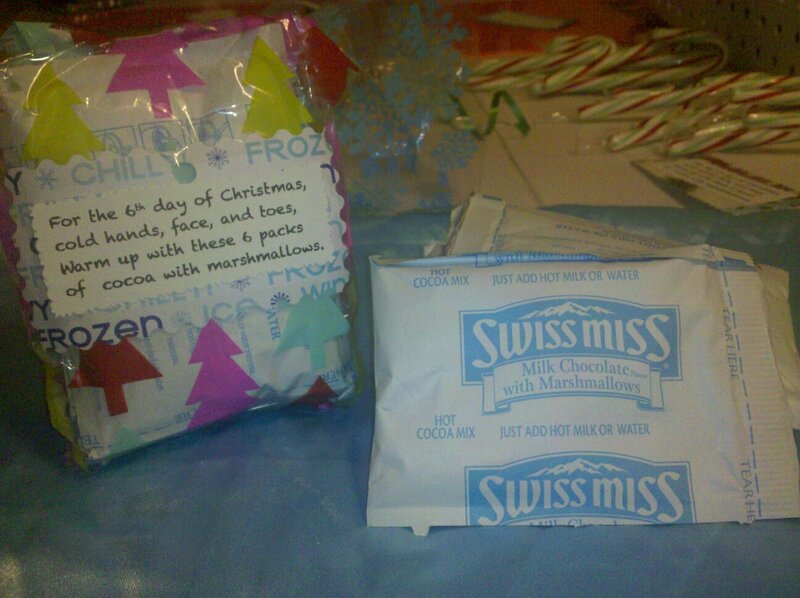 Day 6: Swiss hot cocoa, you could add a coffee mug if you wanted to this, which I might do, but we all know they end up in a yard sale or goodwill within time. I try to stick to things that I know will be used up, or they will treasure. 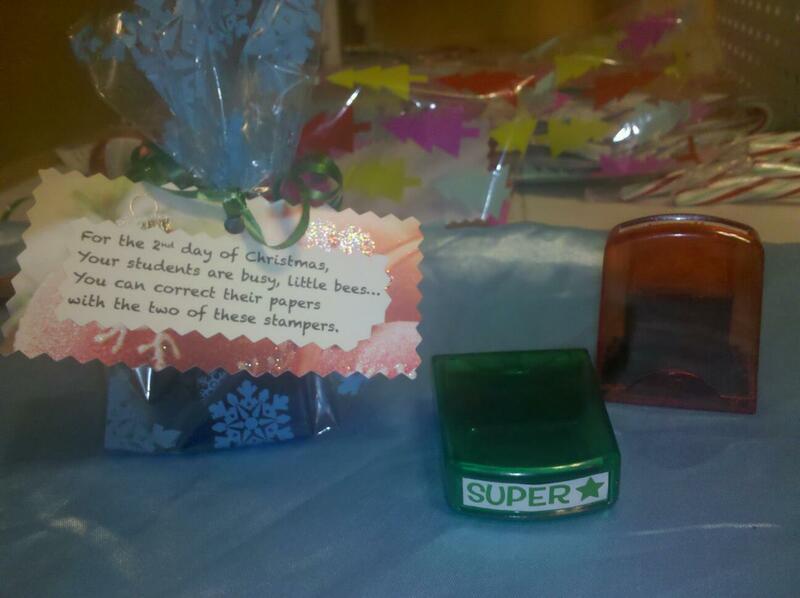 Or you can make it into “cocoa in a jar” and make it pretty with some printable description stickers. Another BOGO item at Publix. 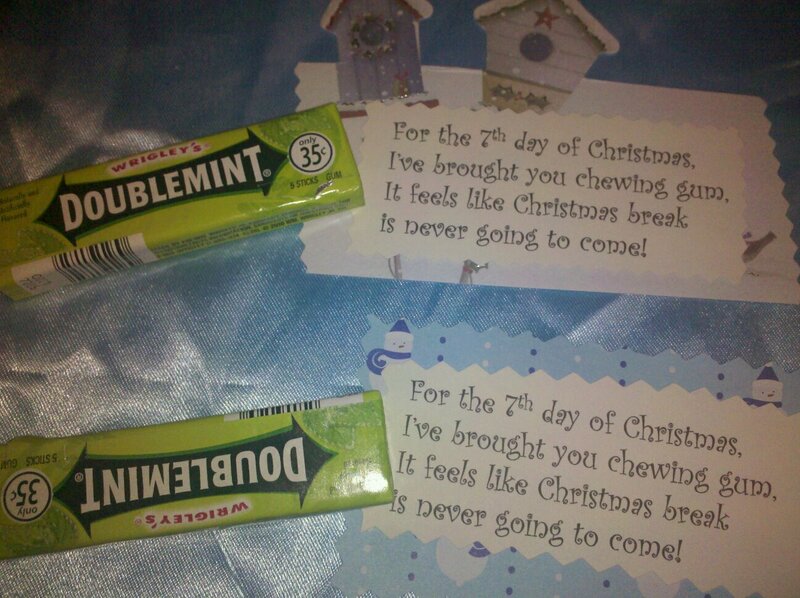 Day 7: A pack of gum. This one was hard, I could not think of anything in “7’s” that would work, but the rhyme worked with it. 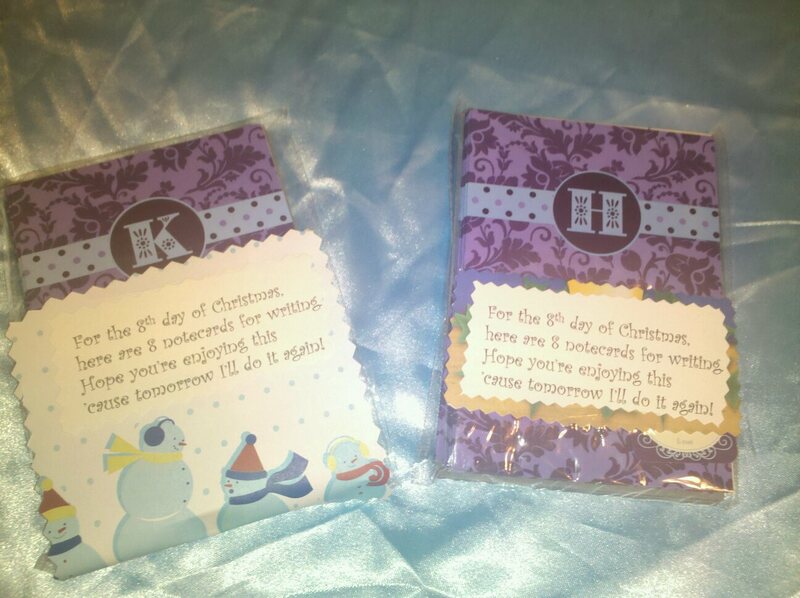 Day 8: A pack of 8 note cards with the teachers initials on them. I found these at Target, they were on clearance in the dollar section after summer for .25 cents a piece. 9th day 9 candy canes, of course these you can find anywhere right now, best priced place I have found is dollar stores, or dollar tree stores. Day 10: A pad of post-its. Another Target clearance find. 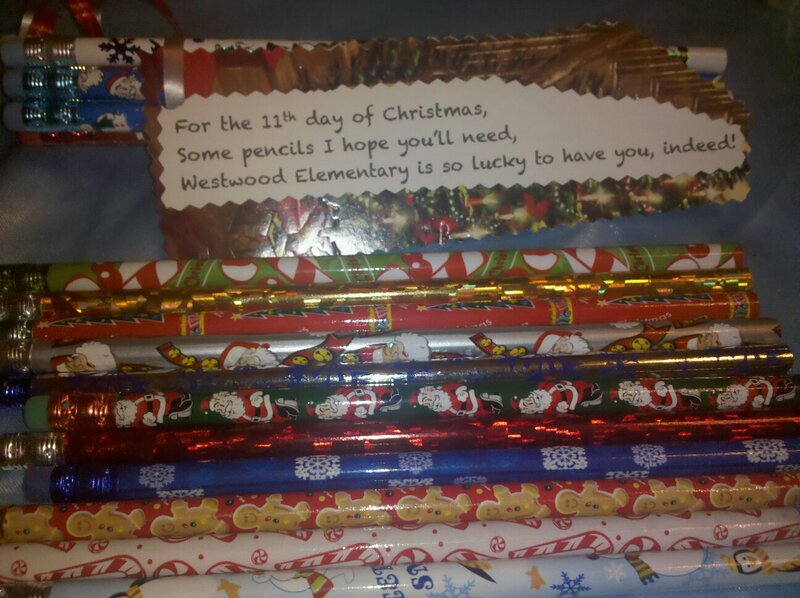 Day 11: 11 holiday pencils. You can find these at Walmart,Target just about anywhere. I of course, going with the trend found these last winter on clearance 90% off at Target, and was just holding on to them for something special. Day 12: I don’t have a picture of this just yet. I am going to give each teacher a small basket with 12 apples in it. Apples are a good fall/winter fruit and normally you can find them on sale easily in the grocery. So make your teachers happy, they will smile from ear to ear. Happy Holidays, Merry Christmas, from mine to yours. Click here to follow our updates. First Post! Here we are! !